Slow cooking is a cooking method that uses a countertop appliance referred to as a slow cooker. Slow cookers are often referred to as Crock-Pots®, which is actually a brand name for a type of slow cooker. See the Slow Cooking Guide to learn about slow cooking. 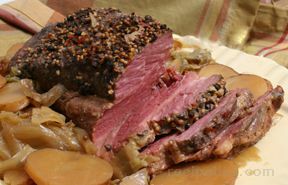 The food is placed in the slow cooker, covered and then cooked at a low temperature for anywhere from 4 to 12 hours, depending on the type and quantity of food being cooked. The slow cooker maintains a consistent temperature through out the cooking time. 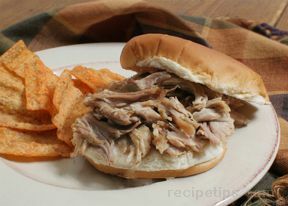 This slow cooking process produces a moist, flavorful food.There are many easy slow cooker recipes available. Slower cooking meat recipes, slow cooking soup and stew recipes, and slow cooking whole meal recipes are common recipes used for the slow cooking process. Slow cooking is a cooking method that uses an electrical countertop appliance referred to as a slow cooker. Slow cookers are often referred to as Crock-Pots®, which is actually a brand name for a type of slow cooker. 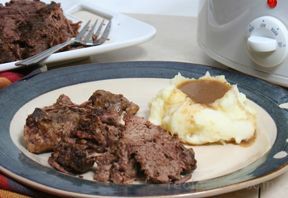 The food is placed in the slow cooker, covered and then cooked at a low temperature for anywhere from 4 to 12 hours, depending on the type and quantity of food being cooked. The cooker maintains a consistent temperature through out the cooking time. This process produces a moist, flavorful food. The slow cooker generally consists of a stoneware liner that holds the food, a heating unit that holds the liner, and a cover. The unit typically heats to between 200°F (on low setting) to 300°F (on high setting), with the food often not reaching more than 212°F. Because of the low temperatures, longer cooking times can be used without burning the food being cooked. Food can be placed in the slow cooker before you leave for the day and it will be ready when you get home. Because of the low cooking temperatures, it is safe to leave the slow cooker unattended and if the food cooks longer than required, it generally does not overcook because of the low temperatures being used. Slow cookers are great for cooking tougher, less expensive cuts of meat and sturdy vegetables. 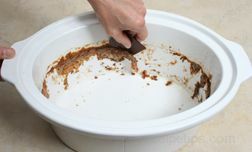 The cover is left on through out the cooking time when using slow cooker recipes, which causes moisture to form and fall back on the food, keeping it moist. 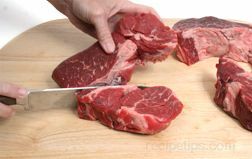 The collagens in the connective tissues of the tougher cuts melt and help tenderize the meat. 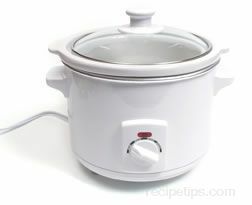 The slow cooker is also used to cook other types of food, such as vegetables, stews, soups, side dishes, and desserts. They can also be used to cook complete meals. Many slow cooker recipes can be prepared the night before and stored in the refrigerator overnight. It can then be taken out in the morning, placed in the heating unit, and turned on to cook throughout the day. Slow cookers require very little power to run and will not overheat your kitchen. They are convenient to use when you have to take food to gatherings outside the home. The food can be cooked in the slow cooker and left in it to be transported. It can then be plugged back in to keep the food warm. It eliminates the need to find room in an oven to keep the food warm until serving. When it comes to selecting a slow cooker there are many different types and features to consider. Shown below are some of the varieties and features that are available. Becoming familiar this with the options that are available will help you make the right selection when you go to purchase a slow cooker. Most slow cookers are round or oval in shape but there are some rectangle shaped cookers available also. The shape you select will depend on the types of foods you plan on using it for most often. 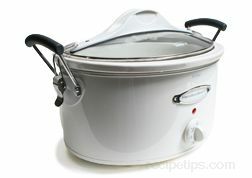 Round: A round shaped slow cooker is well suited for soups, stews, side dishes and casseroles. 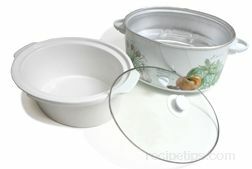 It also works well for some types of appetizers and for steam cooking desserts in round baking pans. 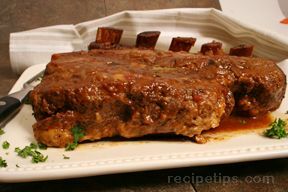 It does not work as well for larger cuts of meat, such as roasts and racks of ribs. Oval: An oval shaped cooker is well suited to larger cuts of meat such as roasts, chops and racks of ribs. It works well for steam cooking desserts in rectangle shaped baking pans. Small whole fish fit best in an oval shaped cooker also. Rectangle: A rectangle shaped cooker generally has a non-stick metal pot with deep sides. The pot sits on a base that has a dial temperature control for heating the pot. 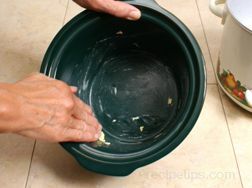 The shape and size of the pot allow it to be used for some larger cuts but works well for other dishes, such as soups, stews, and casseroles. Slow cookers range in size from 1/2 quart mini cookers to 8 quart large cookers. The size you select will depend on what type of food will it be used for most often and what quantity you will need to prepare. 1 to 2 Quart Mini Slow Cookers: This size slow cooker is generally used for hot dips and spreads or for cooking a 1 or 2 serving dish. They are convenient for a single person and do not take up much room for storage. There is also a very small 1/2 quart slow cooker that can be used to keep dipping sauces or melted butter warm. 3 to 4 Quart Slow Cookers: This medium size is great for fixing dishes for 3 to 4 people. It also works well for larger quantity dips or appetizers, such as meatballs or chicken wings. 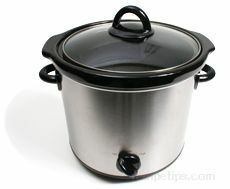 5 to 6 Quart Slow Cookers: A cooker of this size is necessary when preparing a dish that needs to feed more than 4 people. 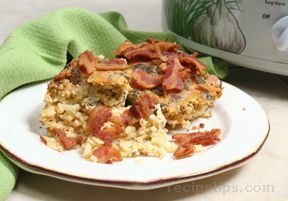 It works great when you need to make a dish to take for holidays or for potluck suppers. 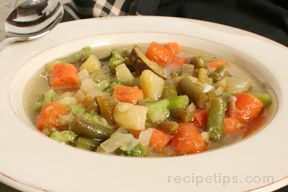 It is also useful when trying to make complete meals that consist of meat, potatoes and vegetables in the slow cooker. 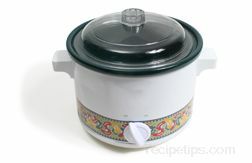 7 to 8 Quart Slow Cookers: These extra large slow cookers are used when extra capacity is necessary. They are nice when making meals for large families or when you are having extra guest. They work well when cooking a large chicken and you want to slow cook other vegetables along with it. Note: When considering a size to purchase, keep in mind that the cooker should be 1/2 to 3/4 full for the most efficient cooking. The cooking pot, generally referred to as a crock, is a ceramic, metal, or cast aluminum pot that is removable or permanently fixed in the heating unit. 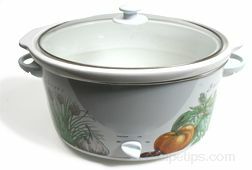 When slow cookers were first introduced, they were mostly of the fix crock variety but present day models are most often removable, although the fixed models are still available. 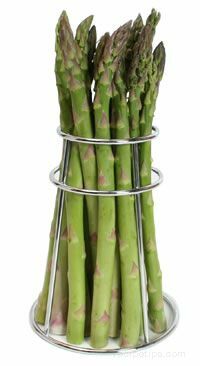 The removable variety is more convenient in that it is easier to clean and can be placed in the refrigerator to store a dish before cooking and can also be used in the oven. The crock can be found made of ceramic, metal, or cast aluminum. See advantages and disadvantages of each below. 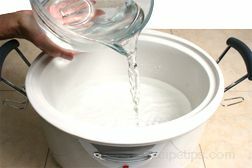 Ceramic: The ceramic crock retains heat fairly well and distributes it evenly. It can be used in the oven but not under a broiler. Ceramic crocks cannot be used on the stovetop so when foods need to be browned before cooking, another pan has to be used. Ceramic crocks can also be used in the microwave. The ceramic crocks are heavier in weight than the other types, making them a little more difficult to handle. Metal: Metal crocks are typically rectangle or oval in shape and sit on a base that is the heating unit. Because its heat source is the griddle, it heats only the bottom of the pan so it does not cook as evenly as other type crocks that set in a heating unit that provides heat at the bottom and in the side walls. 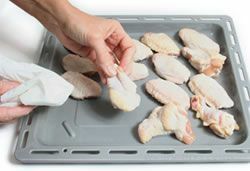 They are available with a non-stick surface inside or stainless steel. Metal crocks are very similar to a regular pan that is used on the stovetop. It can be used in the oven, under a broiler, and on the stovetop. When foods need to be browned before cooking, it can be done right in the cooking pot. 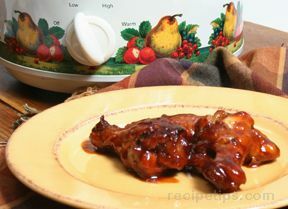 This eliminates the use of another pot and the food gets the advantage of the extra flavoring form the browning process. Metal crock cannot be used in the microwave. Cast Aluminum: This type of crock has a non-stick surface and provides for even heating. It can be used in the oven and on the stovetop but cannot be used in the microwave. 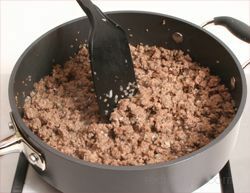 Since the cast aluminum crock can be used on the stovetop, it eliminates the need to use a separate pan when having to brown meat before cooking. To prevent damage to the non-stick surface, metal utensils should not be used with this type of crock. The cast aluminum pan can be used as a pan on its own for cooking food in the oven or on the stovetop. 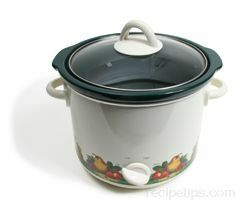 Slow cookers with this type of crock are generally more expensive than those with the ceramic or metal type crock. The lids to the slow cookers are made either from glass, heat resistant plastic or stainless steel. They sit snugly on a ridge around the top of the crock without leaving any gaps, but they are not hermetic, meaning that they are not airtight and will not form a seal. 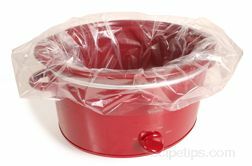 It is important that the lids do not seal so that pressure does not build up in the cooker during the long cooking time. 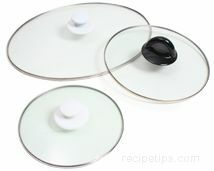 The lids are generally clear so that the food can be viewed while cooking without having to lift the lid off. The plastic lids are nice in that they are lighter and cooler to handle but they may turn cloudy after repeated use, making it hard to see through them. There are also slow cookers now available with clamp-on lids. This is a useful feature when transporting a slow cooker with food in it. The clamps are not used during the cooking process. There are basically two types of heating units. One type is a metal pot, which has electric heating elements encased in the walls. The crock sits inside this pot. The other one is a griddle type heating unit where the crock sits on top of it. Features of each are described below. Griddle Type: This type of heating unit has a dial temperature control rather than "Low-High" type controls. With this unit there will be more varying degrees of temperature and may be more difficult to control. 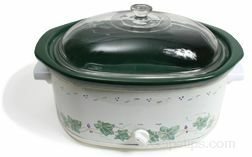 The crock for this unit can also be used on the stovetop and in the oven. The heating unit can also be used as a griddle to cook other foods. Pot Type: The metal pot type heating unit has electric heating elements in the side walls and/or bottom of the pot. This type of heating unit has many different heating control options. The most basic heating control option is "Off-Low-High". Slow cookers with these basic options are sufficient for most needs but there are many other options available that have some benefits to them. See some of the available heating control options below. Off-Low-High: Basic settings of approximately 200°F on low and 300°F on high. 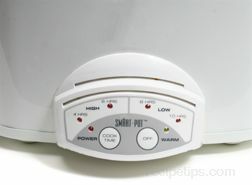 Off-Warm-Low-High: Basic settings plus a "Warm" setting to keep food warm until it is ready to be served. Off-Low-Medium-High: Basic settings with an additional heat setting between 200° and 300°F. Off-Low-High-Auto: Basic settings with an "Auto" feature that is thermostatically controlled so that when it is selected, it starts out heating on high and once it reaches the high temperature it automatically switches to the low setting. This takes approximately an hour, depending on the type and quantity of contents in the slow cooker. Programmable:Some of the slow cookers that are programmable can be set to cook for 4, 6 or 8 hours and then the unit will automatically switch to a warm setting. 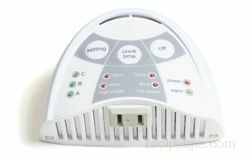 Other programmable units can be set according to the type of food being cooked, such as soup, poultry, or beef or it can be programmed for several different times and temperatures. The unit has a digital probe and when the food has reached the appropriate temperature for the type of food selected or the programmed times, it will automatically switch to a warm setting. Browning Units: Some slow cooker models are available with temperature settings of 350°F to 450°F, which allows food to be browned in the unit before starting the slow cooking process. Cords: Most slow cooker have short attached cords. Some units are available that have detachable cords or retractable cords. Power Lights: Not all units have lights on them. The lights on a slow cooker can be just a power light indicating that the unit is on, a light that goes on indicating that it has reached the temperature it is set for or it may turn on when first plug in but the light goes off when it reaches the appropriate temperature. If your unit has a light, be sure to read the user's guide for the slow cooker to be sure of what the light is an indication of on your unit. Divided Inserts: Some slow cookers come with two crocks. One is a normal crock for the slow cooker and the other crock is divided through the middle to allow two different types of dishes to cook at the same time without mixing them together. 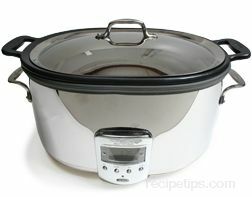 There are several details to consider when deciding on what features and type of slow cooker will best fit your needs. Shown below is a list of details to consider when making your selection. 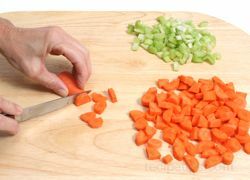 Shape: Consider the best shape for the type of food you will most often prepare. See suggested shape considerations above. Size: Be sure to select a model large enough for the number of servings you want to prepare in it. You do not want it to be too small but if it is too large it will not work efficiently. A slow cooker works best if it is half to three quarters full. Also consider what type of food you will be preparing in the slow cooker. See the suggested uses for the different sizes above. Type of Crock: The crock is made of metal or ceramic and both have definite differences that are worth considering. See the advantages and disadvantages of each above. Quality: Check to see if the unit is sturdy and that it doesn't have parts on it that seem like they would break easily. Consider the reputation of the manufacturer and whether they are known for producing quality products. Budget: There are many nice features available on different models. Most slow cooking can be accomplished with the most basic model, but you need to decide how important the additional features are in comparison to how much you feel they are worth. Some of the features, such as the programmable heat settings can make the unit very expensive. You need to consider what you can afford according to your budget. See the Heating Unit options and Other Features to see what is available. If maintained properly, your slow cooker should last for many years. When using for the first time, check the unit carefully to make sure the cord is secure, the crock is not cracked and that the cooker does not have any other damage. 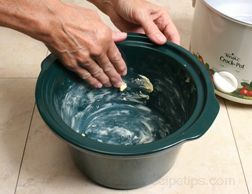 Before using, wash the crock in warm soapy water to remove any manufacturing coatings. If crock and heating unit are all in one, do not immerse in water. Do not add boiling water to a cold crock or expose a hot crock to cold water after using. The sudden change in temperature can cause the crock to crack or warp, depending on the type of material from which it is made. Never immerse the heating unit in water or fill the inside with water. 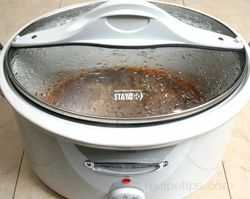 To clean the slow cooker after use, turn the heating unit off and unplug the heating unit before removing the crock. 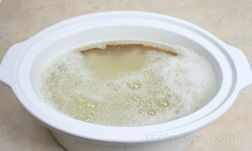 Remove the crock and wash as soon as possible with hot soapy water, but allow it to cool slightly before handling. For cooked on food, allow the crock to cool slightly and then fill with hot soapy water and let it soak for 15 to 20 minutes. The food should loosen while soaking and should be fairly easy to wash off. If some is still stuck, use a plastic or nylon pad or scraper to help loosen the food. Do not use metal pads or abrasive cleansers. When all the food has been removed, rinse well with hot water and dry. 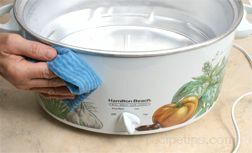 Most slow cooker crocks and covers can be washed in the dishwasher also. If you question whether they can be washed in the dishwasher, check the manufacturer's user manual. 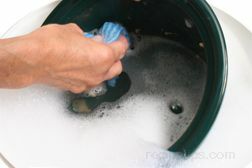 Wash any soiled areas of the heating pot with a damp soapy cloth and then rinse the cloth out and wipe the unit off again. Do not immerse the heating unit in water. Note: For stubborn stuck on food, do not try to remove it from the crock with sharp metal objects, such as knives or other silverware. 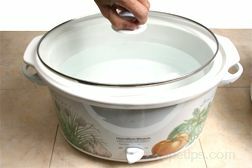 Instead, fill the crock with water so all soiled areas are covered and then turn the unit on high and cook for 2 hours. This should loosen the soiled areas and allow them to be cleaned easily. 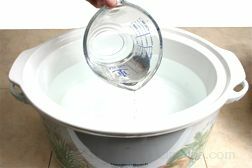 Fill the crock 1/2 to 3/4 full with hot water and add 1 cup of white vinegar. Place the cover on the slow cooker and turn on high for 2 hours. After the two hours, wash as stated above. The mineral stains should wipe off easily. Slow cookers are made of different materials so it is best to check the manufacturer's manual to see if there are any special care instructions that should be followed so that the surface of the crock does not get damaged. Also, some materials may require seasoning before use so it is best to read the manufacturer's manual before using the slow cooker. 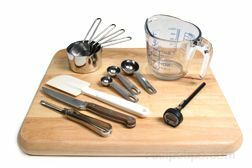 "I like the Hamilton beach round one and I use Miriams Earthen Cookware for the inserts or crocks as you call them. I prefer the MEC inserts because they're made of pure clay and have no metals leaching into my food, i need to be especially concerned because food is going to be cooking in these pots for a long time. The taste of the food cooked in these pure clay pots is great too. Would highly recommend them to everyone to get one for their kitchens... You have to season them separately before 1st use. They sell exclusively online and it’s the manufacture selling direct--so you can get a good price on it. Google MEC cooking pots and you should find them. Make sure you double check the inside dimensions of your crock pot with the outside dimension of the size of MEC pot you're about to purchase and you should be all set. Start cooking healthy delicious meals in your pure clay healthy crock!"